Gideon’s Promise: Do Low Pay and Heavy Workloads Undermine the Right to Counsel? In its landmark 1963 decision Gideon v. Wainwright, the Supreme Court mandated the right to counsel in federal and state criminal proceedings. Fifty-one years after that unanimous decision, some question whether Gideon’s promise has been fulfilled, as public defenders struggle against heavy caseloads, limited resources and low pay. 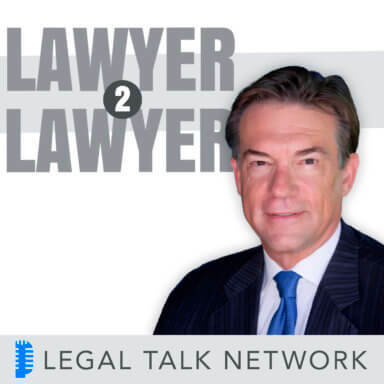 On this episode of Lawyer2Lawyer, hosts Bob Ambrogi and J. Craig Williams interview Jonathan Rapping, founder of the Atlanta-based public defender training program Gideon’s Promise, and Dawn Porter, director and producer of the documentary Gideon’s Army. Together they discuss the daily rigors faced by public defenders in the south, their personal beliefs about unequal access to justice, and their ideas about how to better deliver on the promise of Gideon. Jonathan Rapping is the president and founder of Gideon’s Promise, a training and support group for public defenders in the south aimed at creating greater access to justice for indigent defendants. He is also the director of the Honors Program in Criminal Justice at Atlanta’s John Marshall Law School, where he teaches criminal law and criminal procedure. Rapping is the former director of public defender training programs in the District of Columbia, Georgia, and Louisiana. He is the recipient of the Lincoln Leadership Award from Kentucky’s Department of Public Advocacy, the Sentencing Project Award from the National Association of Sentencing Advocates and Mitigation Specialists, and the Gideon’s Promise Award from the Southern Center for Human Rights. Dawn Porter is a lawyer and the founder of Trilogy Films. She was the director and producer of the award-winning Gideon’s Army, a documentary about public defenders associated with Gideon’s Promise, which premiered at the 2013 Sundance Film Festival and aired on HBO Documentary Films. Prior to beginning her film and television career, Porter worked as an attorney at Baker & Hostetler and ABC Television Network. Among her many projects, she directed “Spies of Mississippi,” a documentary on PBS about celebrity Chef Alexandra Guarnaschelli; produced “Serious Moonlight” starring Meg Ryan and Timothy Hutton; and produced “The Green,” an independent feature starring Cheyenne Jackson (from 30 Rock) and Emmy-winning actress Julia Ormond.